The God Wars Dungeon (GWD) is an immense dungeon located beneath the ruins north of Trollheim. It is known as one of the most dangerous places in RuneScape, and inside you'll find the warriors of Saradomin, Zamorak, Armadyl and Bandos. Take the utmost care in this dungeon, for a small mistake could be your death. Using higher quality items, and higher levels will make it safer, but a higher cost when you die. The God Wars Dungeon is comprised of several areas, these being the main area, Armadyl's Eyrie, Bandos's Stronghold, Saradomin's Encampment, and Zamorak's Fortress. Each area will require a skill level to gain entry to, and perhaps a particular item. You cannot use stat boosting potions to gain entry to any of the areas. Each of these areas have a series of high leveled, and aggressive monsters, along with a general, and 3 sergeants. The generals and sergeants of each section will always act aggressively towards you, but if you wear an item of the god that the corresponding army represents, the lesser monsters of that faction will become non-aggressive towards you. For example if you wore a Saradomin stole, you would not be attacked by followers of Saradomin, but still be attacked by followers of Armadyl, Bandos and Zamorak. Commander Zilyana, Bree, Starlight and Growler would still attack you. Withdraw your complete inventory, as you would like it to appear. Bank 3 items, then withdraw 4x law rune, 4x fire rune, and a Ring of Duelling (or other teleportation jewelry that teleports near to a bank). Cast Trollheim teleport, drop two pieces of food or potions. Rub your Ring of Duelling, and teleport to Castle Wars. Now store your Ring of Duelling, and withdraw 3 pieces of food (or potions). Then cast trollheim teleport, leaving you with 2 inventory spaces. Now pick up the two pieces of food (or potions) you dropped here earlier for a complete inventory. On your first trip to God Wars, bring a rope. Go to God Wars in the way suggested on the map, then speak to the fallen knight near the entrance. Complete the conversation, then use a rope on the entrance. The rope will stay there always. On your screen a killcount meter will be displayed. This is to show you how many followers of each god you have defeated. To gain entrance to a general's room you require 40 killcount of the respective army. For example to gain access to K'ril Tsutsaroth's room you would need 40 kills of Zamorak followers. Each of the generals has two or three attacks. Melee attacks will only hit one person (the tank, who takes the main damage) while ranged and magical attacks will hit everybody in the room. K'ril Tsutsaroth: Melee, magical and extremely powerful magical attacks which he will use if you have been using protect from melee to fend from his attacks, it also drains your prayer. The General of each god has a small chance of dropping the hilt of a Godsword, which can be coupled with the three shards of the godsword (dropped by Generals and Sergeants) to create a godsword of the respective hilt. To smith godsword shards together requires 90 Smithing. Hilts can be exchanged with blades by clicking 'dismantle' on a godsword, then using another hilt with the blade. God wars is a risky, yet large source of income for skilled and lucky adventurers. You can solo with lower levels, and fail with these, but this is what is recommended. You need a Bandos and a Zamorakian item, make sure of this in your setup. Weapon: Godsword or whip, if using whip wear Dragonfire shield. Legs: If using Bandos Godsword or Bandos boots use Verac's skirt, if not use Bandos's tassets. Amulet: Amulet of Fury, Glory or Strength. Cape: Zamorak mage arena cape (Zamorakian item) or cloak. Optional: Dragon halberd for spec. Get 40 killcount on goblins north east of the entrance (near the Zamorak bridge) open the large door, and walk to General Graardor's room. Then drink potions in this order: 1x Saradomin brew, 1x super restore, 1x super attack, 1x super strength. Activate the special attack on your preferred weapon. Activate these prayers: protect from melee, piety, and protect item if you wish. Enter the room, and attack general Graardor. Eat sharks when required. After he is dead pray melee and kill the range minion, then the melee minion, and the mage if you have time. After killcounts, both players meet at Graardor's door. Then first player to enter activates protect from melee and piety, the second to enter turns on protect from ranged and piety. Both players take turns at tanking (hitting bandos before he can damage the other), and healing until both inventories of food are used. Afterwards both players teleport out, restock inventories and get killcounts again. You could do this with lower levels, keep in mind these are just recommendations. Same equipment as the Duo section. Saradomin brews and super restores; bring 1 super restore for every 2 saradomin brews you bring, fill your inventory with Them. The super restore is to counteract the effects of the Saradomin brew and restore your prayer. Enter the room before your team, ensuring everyone is ready to enter straight afterwards. Activate protect from melee, piety and protect item if you wish. Enter the room, and attack Graardor. As soon as you have attacked graardor your team should enter and attack him. After you have killed Graardor kill the melee, ranged and magic minions. After the general and the sergeants are dead the team should stack in the sw corner, the tank should stand out and scroll his screen down so he can see where Bandos spawns. When Bandos spawns attack him before he hits one of your teammates. Drink saradomin brews as you need (remember the dose of restore for every 2 doses of brew). You must wear a full set of Guthan's. Keep in mind your Bandos and Zamorak items. When Graardor spawns use the same prayers as before, attack him, then run to the range minion and attack it. Your teammates will be doing the damage to Graardor, while you will (hopefully) be using the Guthan's set effect to heal from the range minion. Q: Why use the Range Minion, and not Graardor? A: Graardor has far to much Defence to get reliable hits on with a warspear; the Ranged Minion has much less Defence. He also deals the least damage (considering your equipment), and the melee minions habit of walking around will often make Bandos switch opponents. 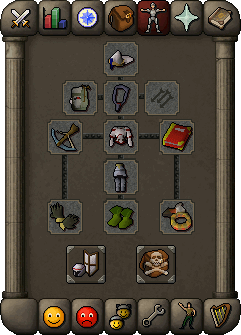 Remember you will need a Zamorakian and a Bandos item, you can wear an item during killcount and substitute it for another in the General's room. This is optimum equipment, you can substitute it for what you have. After the tank has entered, pray protect from ranged and piety, then enter. Attack Graardor after the tank has. When Graardor respawns, wait for the tank to attack him, then attack afterwards. There are two main setups for Bandos, these being the Void Knight melee set and bandos armor. Godswords are used in both cases. After Graardor dies enter the room, wait standing around his spawn point, which is to the east of the center of the room. Before Graardor spawns, activate protect from ranged and piety. Now when Graardor dies, set a timer up and time how long it takes for him to respawn. Write this number down, and reset the timer after each kill. When the timer is down to 5 or 10 seconds till spawn activate your prayers/drink potions. Attack Graardor as soon as possible, using your special attack whenever possible. You will need a Zamorak item during killcount. Get 40 killcount on imps (there are 4 spawns in the Zamorak area, in the middle and near the door). After 40 killcount stand at the door and drink potions in this order: 1 dose Saradomin brew, 2 dose super restore, 1 dose super antipoison, 1 dose super attack, 1 dose super strength. Then activate prayers: protect from melee, piety and protect item if you wish. Then enter the room, and run to the North West corner. Attack K'ril, eating sharks and drinking prayer potion/restore when needed. When K'ril is dead activate protect from melee (should already be on) and kill the ranged minion, then the melee minion, and the mage minion if you have time. Same equipment as the Solo section. Enter before the rest of your team, drinking a super antipoison dose before entering, with the same prayers as before activated. Run to the North West corner, and attack K'ril. Once you are in the corner your team should enter, with protection from magic enabled. After K'ril is dead kill the ranged, melee and mage minions. After you have killed the general and sergeants the team should stack in the South West corner. When K'ril respawns attack him before he can attack your teammates. Same as tank, if you are high Defence (90+) bring super attack and strength potions. After the tank has run to the North-West corner enter and attack K'ril. Eating as you need. After K'ril is dead attack the range, melee and mage minions. After you have killed the general and sergeants the team should stack in the South West corners. Note: You will need a Saradomin and Zamorak item during the killcount. Warning: Do not attempt to melee Commander Zilyana head-on! Doing so will get you killed within three seconds! Recent modifications have been made to Commander Zilyana's ai, so she cannot be boxed anymore, making the range method quite ineffective, solo ranging still uses the same method without an issue. You can substitute this equipment with what you have. You must use a rune crossbow or an Armadyl crossbow. The only way to effectively solo Zilyana is to ensure that she cannot melee you, so you will be constantly running away from her to avoid her melee attacks, ranging her as you go. You can shoot her once or twice on the short straights, and two to three times on the long straights. After Zilyana is dead kill Bree, then Star, and Growler if you have time. Pray protect from magic, eagle eye and protect item. Do not attempt this on a lag prone world, as it can become extremely difficult. Energy: as you're constantly running, your run energy will be constantly drained. To avoid this energy potions or purple sweets. The two weapons that are effective are the Godsword and Verac's flail (with the helm, skirt and brassard.). Any other weapons are to inaccurate to be useful against Saradomin. If using the Guthan's method, use your Godsword to fight Zilyana, and use the spear if you need to heal on the sergeants. If using the Guthan's. setup, a Guthan's Warspear. Ensuring whoever is being focused on by Zilyana is not hit. When she is more than 4 seconds of movement away from who she is targeting, she will swap targets. 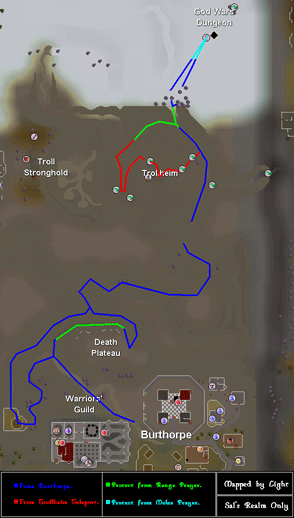 The new target follows the same route (moving away from Zilyana, not through her, until she swaps.) After Zilyana has switched targets the next person she targets runs, and the previous target begins attacking her. Use Tireless Run scrolls when you are low on energy. If you need to heal, run and then eat, never stand still. A variation on this is to use a primarily ranged based armour, and using a godsword to fight her normally. When Zilyana focuses on you, run, equip your bow and shoot at her, while still running (like the solo method) until she focuses on somebody else. Then swap back to your godsword, and attack her again. This allows you to nearly be constantly hitting Zilyana, while taking minimal damage. If using Guthan's., equip the spear after Zilyana dies and heal on the sergeants. Note: You will need an Armadyl and a Zamorakian item during killcount. Saradomin brews and super restores (bring 2 saradomin brews for every super restore). Pray protect from ranged and eagle eye, then enter Kree'arras room. Run and stand on the wall near the altar (this will stop his attacks from pushing you backwards, but you'll still be stunned). Attack him, and when you need to heal stand underneath him. He will only melee if you are not attacking him, so if you eat he will melee you (it's a strong, accurate and fast attack, so best not to be hit by it). To avoid this stand underneath him and heal, he will be unable to attack you for a short time. Then quickly attack him after eating. After Kree is dead kill the range minion, then the melee and mage minions. After entering (pray range and eagle eye) stand on the altar wall (to stop you being pushed back) and range Kree. With 4 people when you need to eat you do not need to stand on top of Kree unless he is directly next to you. After Kree is dead kill the ranged minion, then the melee and mage minion. Wait on the altar wall for Kree to respawn. It's inevitable that at some stage, you or somebody in your team will lag, disconnect, or simply not know what their doing and die. Keep in mind that what you would expect them to do the same for you if you were to die. Q: Will a ring of wealth work here? 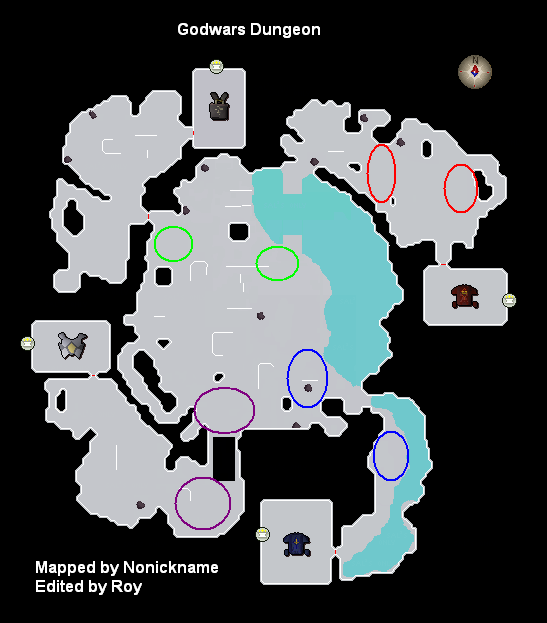 Note: This only works in the Wilderness God Wars Dungeon north of the Wilderness Bandit Camp as Aviansies in the normal God Wars Dungeon do not drop noted Adamant Bars. It's entrance is next to a cliff. Beware of Player Killers! Aviansies are graceful flying creatures of Armadyl, who can only be hit with ranged or magical attacks. They range in levels from the 60's to the 130's. They have a common drop of 4 adamantite bars (noted) so they are a good, reliable source of money. They are skilled rangers so you will need to balance your ranged Defence and ranged attack. There are two main methods to kill Aviansie with, these being Tanking and Prayer. Easier - Less attention required, semi AFK. You can substitute this equipment for what you have, but remember an Armadyl and a Zamorakian item. The Armadyl item is not required if you are praying. If you are tanking you can substitute the range legs for heavier armored legs. 1-2 monkfish or shark for emergency healing. Run north of Bandit Camp, crawl through the crevice near the cliff, then crawl through the crack and run into God Wars. Move slightly southwest of the entrance, activate protect from ranged and attack aviansie at your leisure (the lower leveled the better). Drink prayer potion doses when needed and collect any valuable drops. Once you have used your prayer potions teleport out, restock and go again. You can either go slightly south of the entrance or inside the Eyrie. Inside the Eyrie is less crowded but the Aviansies there are slightly stronger. When you kill an Aviansie collect the drop and pick up the bones. Do not pick up the bones if you don't have space. Once you have used your starting food cast bones to peaches and use the peaches to heal, collecting bones as you go. Again, when you have a full inventory of bones and no other food cast bones to peaches. Crashers: group of people who will attempt to steal your GWD world by getting more kills than your team. eg. 90+ or 80+: the levels a team (or player) is requesting you to be to join their team. Tank: person whom the main attacks of the general are focused on; takes most of the damage. Pot: Potion, usually referring to super attack and strength potions in this situation. Leech(er): somebody who enters on your team solo and attacks the minions. DD: Deathdot (all players stack on 1 square)- useful at Kree'arra so you can turn on prayer when Kree spawns, conserving prayer and nobody gets hit.